TOP PSNI officers were challenged on a range of policing issues at a public meeting of the West Belfast District Policing Partnership held in the Highfield Community Centre in the Shankill Road area on the evening of Tuesday, 24 February. Sinn Féin DPP members Councillor Máire Cush and Councillor Janice Austin were at the meeting along with other republican members of the DPP – West Belfast tourism group director Harry Connolly, Beechmount community worker Áine McCabe, Sinn Féin political advisor Rosie McCorley and Falls Community Council chairperson Liz Groves. DPP member Áine McCabe questioned the PSNI on the lack of resources being given to ‘Operation Streetsafe’, aimed at curbing anti-community behaviour in the lower Falls. PSNI policing inadequacies in the lower Falls were also raised by Eamonn Andrews, a member of the Falls Residents’ Association. He highlighted two incidents which occurred recently. The first was on the afternoon of 26 January, when an unmarked police car chased a car into St Peter’s Court. After the occupants fled, the PSNI drove away and within half an hour the car had been taken again. The second was on 16 February when anti-social elements began gathering beside cars belonging to people who were in St Peter’s Cathedral watching a concert by ‘The Priests’ singing group. Mr Andrews chased the anti-social elements but was stopped by the PSNI during his pursuit while, at the same time, a car was being burnt out 20 yards away. Harry Connolly raised the issue of police resources, saying that more constables needed to be on the street and proposing that the land on which the largely unused New Barnsley PSNI station sits is sold to fund an increased police presence on the ground. Safer Neighbourhood Project activist Seán Osborne heavily criticised the PSNI for their handling of an incident that occurred on the Falls Road on 19 June 2007 when a man carrying what turned out to be a replica gun attempted to hijack a car with a woman and child inside. Osborne courageously tackled the man and the incident, which was filmed on a mobile phone, subsequently received tens of thousands of hits on You Tube. The PSNI watched the situation but did not intervene and took almost 45 minutes to respond to an emergency call in relation to the incident. The PSNI have, incredibly, never spoken to Seán Osborne about the incident and the Public Prosecution Service recently announced that they will not prosecute the individual concerned. Sinn Féin Councillor Máire Cush asked whether the PSNI felt the case they presented to the PSNI was strong enough to warrant prosecution and their reply was that they felt enough evidence was available. 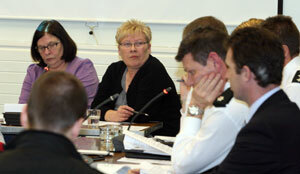 At the end of the meeting, Máire Cush spoke about the public consultations that had been held throughout west Belfast in the previous months by the DPP members in relation to shaping the policing plan for west Belfast for 2009. “This was the first time that the public have been consulted properly on the policing plan and there have been improvements when compared to previous plans.